This is my first challenge as a new member of The Cake Slice Bakers. I joined this group after purchasing the cook book "Sky High : Irresistible Triple Layer Cakes" by Alicia Huntsman and Peter Wynne. Ive always admired tall, complicated cakes, but never had the courage to tackle one myself. I'm happy to say I have conquered my fear of layered cakes! This Southern Coconut Cake was a great intro for me. The layers are filled with the frosting so no additional prep needed to make fillings! I halved the recipe to make a 6 inch cake. This cake was so delicious I could have eaten an 8 inch-er! The batter came together easily and the recipe was straight forward and easy to follow. There is not as much "hand holding" as in Dorie Greenspan's recipes but the directions are clear and I got great results. As I said in an earlier post I am the custodian of a 50 pound bag of cake flour and I think having that much cake flour has given me an immortal quality to my cake baking... even if I fail, hey, I have 48 more pounds! So on to the cake description! This was baked in 3 pans 6" pans. The layers did not rise very much and the tops were a little sticky due to my oven sucking! The little cake discs were nice and level and easy to build with. I bought new cake pans that I love... yep pan love, sort of like gadget envy! They are Parrish magic line cake pans. This cake was "just like a cake mix cake" to quote one of my tasters. I'm guessing that is high praise? It was really white with a tender crumb. It was not overly sweet. I thought the cake was lacking some coconut flavor and I would add some coconut extract next time. Yes, there will be a next time my friends! The frosting gave me problems. It was more like whipped cream. Very tasty. Very airy and soft. I decided to toast some shredded coconut and throw that around for decoration on the top and in between the layers. 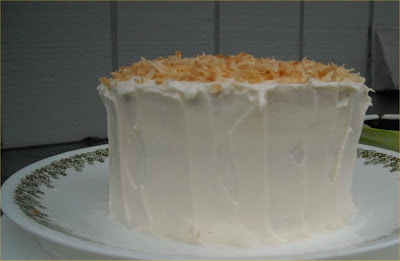 The coconut added a nice chewyness to a very soft cake. A big thank you goes out to Gigi and Katie for creating this awesome baking group. You ladies rock! 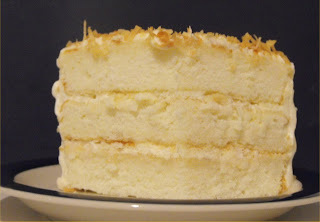 Be sure to check out other members posts of the southern coconut cake at the Cake Slice Bakers. I agree on all counts... soft cake, soft icing, more coconut would be nice for those that like coconut. It looks like a beautiful cake. Did you toast the coconut on top. Great idea.